Find sensitive data in unstructured sources through multiple techniques at once. Produce the search results and attendant metadata in a structured file for further use, and simultaneously redact the PII to comply with GDPR's data portability and right-to-be-forgotten provisions. Whether the PII is on your system or throughout your network, DarkShield keeps you safe. 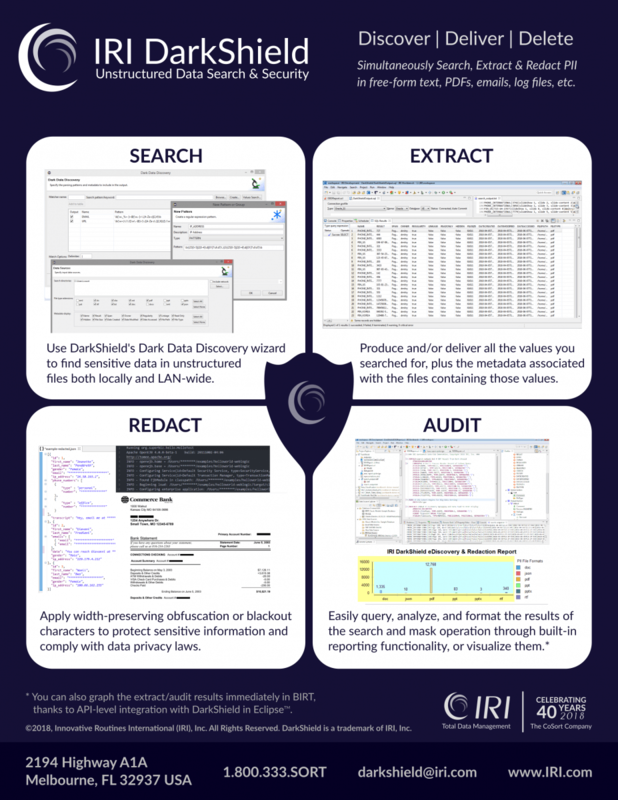 The Dark Data Discovery wizard finds sensitive information in multiple unstructured files in multiple directories and drives, all at once. Query and display DarkShield search and remediation results in its built-in, interactive dashboard. Or, use IRI CoSort, BIRT, or your RDB in Eclipse. Or, export its log data and customize the information display in SIEM tools like Splunk ES, shown here.